Just out of interest I decided last week to revisit Lisp. Usually I have no problem learning a new computer programming language, but when trying Lisp as part of an Open University post-graduate computing course about ten years ago, I didn’t really get on with it. It wasn’t that I couldn’t do it. I passed the module, after all, although not with a great mark. It was more that I didn’t ‘get’ it. So this time, I’m following the book: Practical Common Lisp by Peter Seibel, details of which (and a free electronic copy) you can find on the gigamonkeys site. I think it’s a great tutorial, by the way, and will definitely be buying a copy of the book, if only to show my appreciation. Setting up a development environment is really important whatever language you’re using, whether it’s for the purpose of learning the language or for serious development. In this case, the book recommends using Lispbox, which is just a packaging up of Emacs, SLIME, QuickLisp and a couple of other things. And I guess that this is fine for Windows, but most Linux distributions have all these things (or their equivalents) in their repositories, so I decided to install the bits individually and see where it got me. 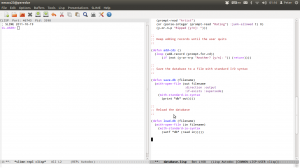 The following describes how I set up these elements on my Ubuntu 12.04 laptop. Simply install Lisp from the distribution’s repository. I don’t know of any distribution that doesn’t include it. 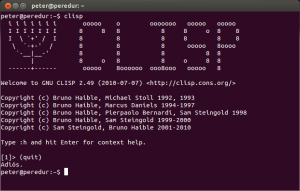 The package name may be different for different distributions, so use whatever search facilities your distribution or your package manager offers and search for something like ‘clisp’ or ‘common lisp’ or just ‘lisp’. You should be able to find the right package. Many developers swear by Emacs: those that don’t swear by VI, I guess. However I’ve always found it a bit of a challenge. It’s not hard, but there are a lot of commands to learn. What’s more if you’re using the GTK+ or the GNU version, many commands are accessible from the menus using a mouse. So flogging your way through the tutorial meticulously trying out commands you’ll probably never use can be a boring and disheartening experience. I did try to follow the tutorial; and not for the first time. This time I got about sixty percent of the way through; which is better than my previous attempts. Fortunately there are a lot of crib sheets available on the web such as the one from refcards.com. At least this frees up some of your personal memory for useful stuff, and probably tells you all you need to know from the tutorial, but in a much more succinct form. GNU Emacs can be installed from the standard repository on every Linux distribution I know about, and can be left configured pretty much as it is after a default install. The only thing I decided to do was to put the scroll bar on the right hand side of the window. GNU Emacs follows the old X-Window convention of having the scroll bar on the left: fine if you’re left-handed, but I’m not. If the .emacs file already existed on your installation and if it already contained a custom-set-variables form, you could add the ‘(scroll-bar-mode (quote right)) to it. Looks like Lisp, doesn’t it? That’s because it is. SLIME is the Superior Lisp Interaction mode for Emacs. It allows you to create Lisp files and debug them without having to swap between your text editor and a terminal window running clisp. Once again, just install it from your distribution’s repository. If your distribution doesn’t have SLIME in the repository, you can download it from the project’s web site and install it following the installation instructions. (Where, following the usual Emacs conventions, M-x means to hold down the Meta key and type ‘x’. The meta key will be either [Esc] or [Alt]. It’s [Esc] on my laptop). followed by [RETURN], and the current working directly will by displayed. On my system, the [RETURN] character is not required for SLIME to prompt for the command name. 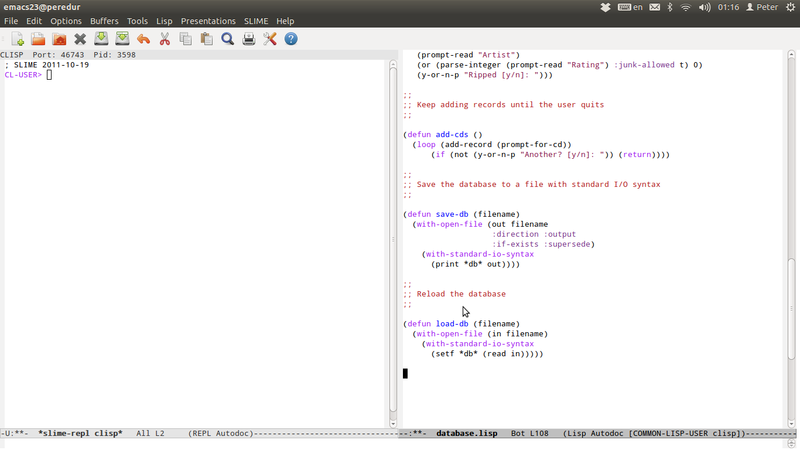 Lisp is starting to make more sense now, thanks to a sensible development environment and, naturally, the tutorial. If other helpful things come to light, I’ll try to remember to include them in a post.